I thought I had survived the excitement of the Con unscathed, but around Thursday the dreaded Con lurgy hit me like a tonne of bricks, and I’ve been the walking dead since. But, it was worth it, I had an awesome time at Natcon. On the Friday I had the privilege of being part of Kelly Link’s short story workshop. Not only did I get excellent feedback on the story I submitted, from Kelly and the group, but we also went through some very useful exercises, one of which I have used already to great effect. I also met some very talented writers and hope to stay in touch with them. It’s amazing how much Kelly packed into the time we had, I can see why she is as highly regarded as she is. After the workshop I didn’t have a great deal of time before my first panel, so after a quick trip to the bar, it was time for Daikaiju Go Heavenly!. As well featuring the dashing Dirk Flinthart, Cat had roped in expert assistance in the form of Robin Pen, and a hilarious panel ensued. I don’t think we really decided on a victor, but I think I defended Christ’s honour reasonably well, though I might have committed both blasphemy and heresy at various points. Dirk Flinthart and Robin Pen impart their wisdom. Then it was time for a quick meal, which in hindsight turned out to be a big mistake, then off to the Twelfth Planet Hour, where we sampled the most incredible range of cupcakes imaginable (well done on an awesome job, Terri!). It was wonderful to spend time mingling with so many people as we celebrated the well deserved success of TPP. And, I accidentally discovered that the cupcakes were capable of exploding in a cloud of cream if dropped…. 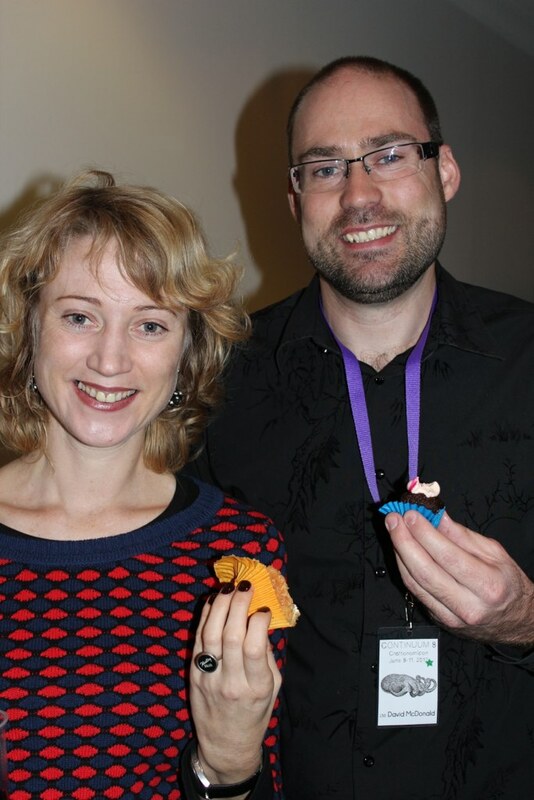 Meg Mundell and I – before the cupcake goes all kamikaze! This segued nicely into the opening ceremony, where the Continuum tradition (well, this is my second) of excellent video montages continued. With a smack of the gavel, the Con was officially launched. I then had to quickly head to another panel, Continuum 101, where I imparted my meagre Con wisdom to an audience of neophyte Con goers who listened very politely. It was around then that I started to feel ill, and I retired to a friend’s motel room to lie down for a while (A big thank you to Steve and Pete who were very generous with their room all weekend), which turned into a few hours. There was a rather embarrassing moment when I staggered out of the room wearing a wet face washer on my hat like a bedraggled hat, only to almost walk into two people I was on panel with the next day (when I attempted to explain the next day they were very understanding, and pointed out it was far from the strangest thing that they had seen at a Con). Eventually I made my way downstairs, bid a few quick goodbyes and somehow got home. The next morning I had two panels on religion back to back, and to be honest I was a little nervous – it isn’t the most safe of topics at times. But, both went really well. The first, New Faiths for New Worlds was really well moderated by Russell, and we covered some interesting ground. Alan and I both picked the same examples for a religion done well and a religion done badly, and took turns beating each other to the punch. The second, Fans and Faith was one of the best panels I had ever been on, and a very different vibe than I was used to. Not only did Mondy moderate brilliantly, with his usual mix of wit and perception, he also raised some points I had never even thought of and gave me a story idea! Through out the weekend I had people, religious and non religious, approaching me to remark on these two panels and tell me how much they enjoyed them or to ask questions, which is not something I have had happen before. After all that excitement I was very happy to take some time for lunch and take in some caffeine, and do some socialising. Then it was off to Winter is Coming, a panel on the various works of George R.R. Martin. After the more serious morning ones, this was a lot of fun, very energetic with lots of audience interaction. We covered everything from piracy to the state of television, as well as plenty of talk about the “Game of Thrones” television series. Then it was time for something that had really been giving me the heebie jeebies, my first reading. It was a bit of an anti climax, four writers from Epilogue facing an audience one person, so Dirk invoked an ancient and venerable rule regarding panels, if the panel outnumbers the audience you all go to the bar! To be honest, I wasn’t that crushed, I had been rather nervous at the idea of reading from my story. Maybe next time. 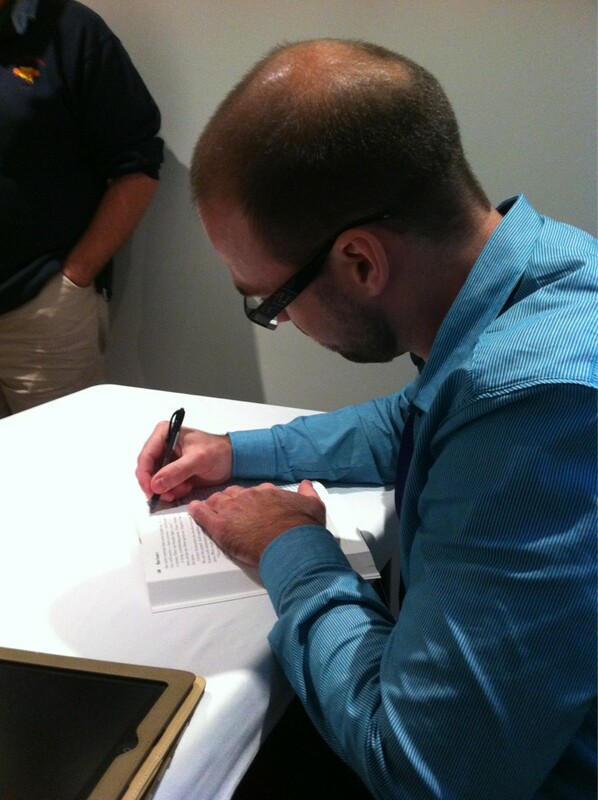 Signing a book for only the second time ever! That was the end of my commitments for the day, which meant I got down to the real business of a convention, socialising! There were so many people to chat to that the time flew. After a lovely dinner, and more time in the bar I realised that, yet again, I had missed the Maskobalo! 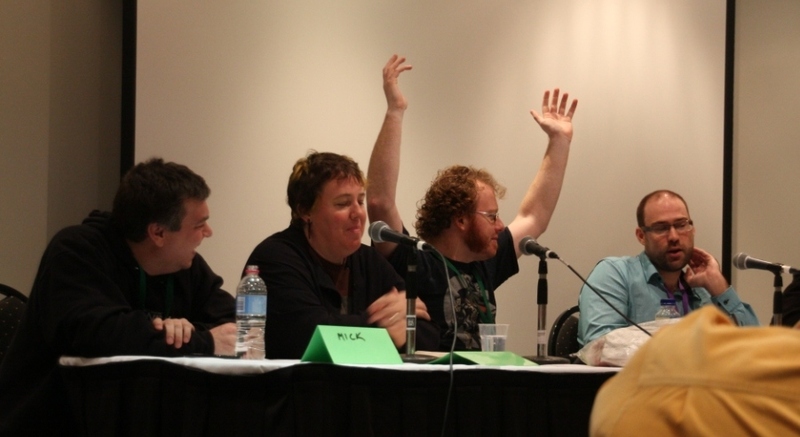 On Sunday, my first panel was a zombie themed one, We Want Your Brainz. Fortunately, a very kind soul brought me in a coffee so I wasn’t a complete zombie myself. We talked about what exactly makes a zombie, and whether zombies and romance are ever a good mix. 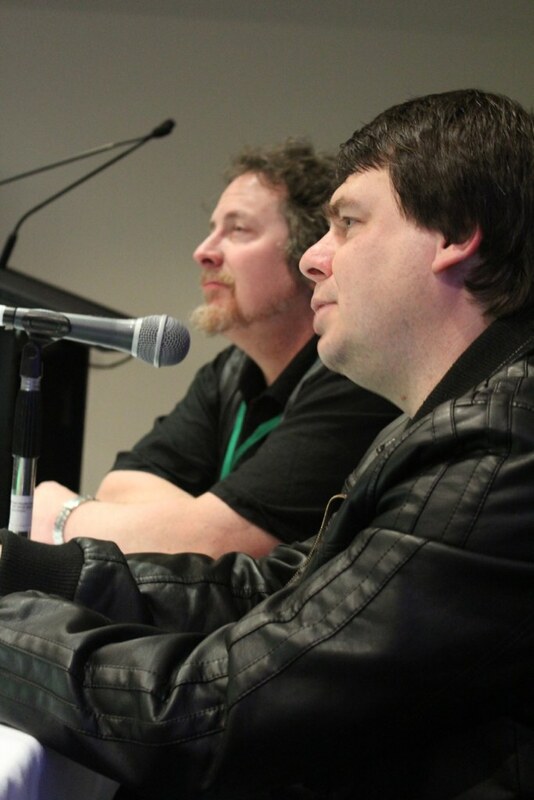 As well as all the other excellent panellists, I got to sit with the author of one of the best short stories I have ever read (Stephen Dedman and his story “Never Seen by Waking Eyes”), which was a thrill. Later that afternoon, after more socialising, it was time for the Newbie’s Guide to Writing, where a bunch of newish writers were able to talk about the mistakes that they had made so that others could avoid them, and pass on hard won tips. We also had the editor of the amazing collection Ishtar present, Amanda Pillar, who gave an excellent perspective from the other side of the submissions process. It was a well attended, and I hope really informative panel. And, that was the end of my scheduled panels for the convention, so I could relax. I then wandered up to the launch of Felicity Dowker’s Bread and Circuses, which was very well attended. I thought Alan Baxter spoke very well, and it was heartening to see all the launch copies disappearing as people put their money where their mouth is, and supported Aussie small press. From there I moved on to the bar, where a large crowd shared a bittersweet hour as we remembered Paul Haines. I say bittersweet because despite the sadness, there were lots of laughs and fond reminisces as people who had known him shared their stories with those who had not had the pleasure. Truly moving. The time flew, and then it was time to suit up for the awards ceremony. Despite the fact that there were a lot of awards to be presented, the evening did not drag at all, thanks in no small part to the excellent hosts, Mondy and Kirstyn. They shared a great chemistry without it being in jokey or over the top, and they kept the night flowing. It was an evening of both celebration and remembrance, with some truly emotional moments that included a number of awards deservedly won by the late Paul Haines and Sara Douglass. There was also a truly beautiful moment when Merv Binns with presented with the inaugural Infinity Award for contributions to the Aussie scene. There was a spontaneous standing ovation as we thanked him for his part in creating the sort of fandom that gives us wonderful events like Continuum. I know they aren’t really some people’s cup of tea, but I’ve loved the awards ceremonies I have been to so far, I am was really happy to see this one follow the trend of last year’s Natcon with lots of people glamming up and a real effort to make them a prestigious event on the spec fic calendar. I really enjoy seeing people’ hard work rewarded, not just for standalone achievements but the awards that recognise an ongoing commitment to the community. It was a very strong field, but I don’t think anyone can argue that the winners did not deserve their awards (and the squeaking octopi that came with them!). After the awards ceremony a few of us wandered back to Lygon Street until we were kicked out of the excellent little bar we found and went in search of more refreshments. By the time I got home it was around 4:30am so I only just made it back to the convention for a coffee catch up with a friend I had to see before they left the state and the Closing Ceremony where all the volunteers and committee members and guests were quite rightly applauded for a stellar convention. On a personal level, I had an amazing time. Getting feedback on a story from someone like Kelly Link was a huge privilege, as was being on a number of panels with her. 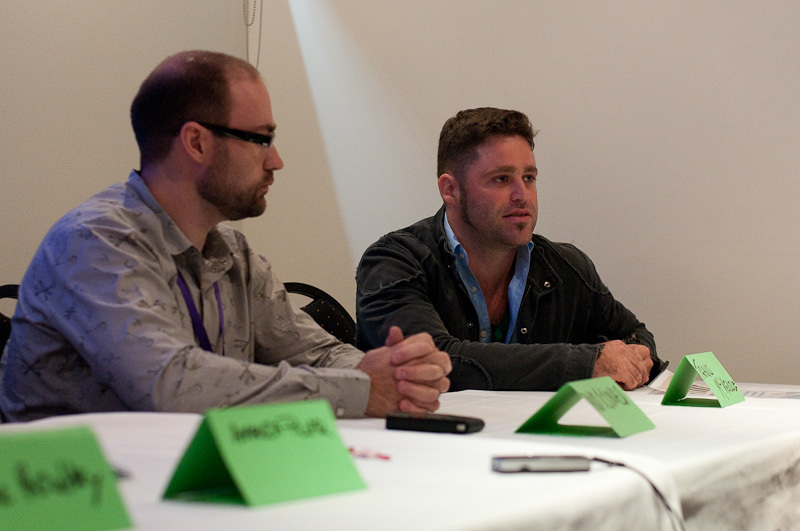 And, I really enjoyed the chance to be on so many panels, despite my relatively minor status in the scheme of things. I was able to catch up with people who I don’t get to see half as much as I would like, and to get to know some people with whom I’d previously only had a fleeting acquaintance with a lot better. And, of course, I was able to make a whole heap of new friends, and meet people who formerly had only been names on a byline or a webpage. As always, I was astounded and delighted by how inclusive and welcoming everyone was. One of the more exciting writerly moments was being asked to sign a book for the first time, and by someone I didn’t know! A measure of how little I was expecting this was the fact I didn’t even have a signature worked out, as I had never expected someone to ask. I just scrawled something and mentally resolved that I would have to work something out for the future. I can just imagine myself sitting with a notepad signing my name again and again like someone about to get married and wanting to get their new name right! I ended up signing three books over the Con which was three more than I had expected, but hopefully they won’t be the last. A central place for people to gather and hang out because, after all, it is the social aspect that makes or breaks a Con. The only possible criticism I could make is that, yet again, the hotel management obviously hadn’t taken warnings seriously enough about how much writers can drink and didn’t have enough staff on hand. One can’t fault the bar staff though, they were unfailingly gracious and polite under a great deal of pressure. And, the other downside of the Con was that it came to end. I always struggle readjusting to life after an event like that, where you have to go back to the boring routine of a day job and not being surrounded by wonderful people who share you passions. But, with Chicon on the horizon, at least I can start counting down to that! This entry was posted in Geek, Writing and tagged awards, continuum, Ditmar Awards, Kelly Link, Natcon, Paul Haines on July 3, 2012 by David. David, I’m one of those people who enjoyed the two panels on religion very much (and told you so!). Sorry to hear only one person showed for the Epilogue reading – the book is a wonderful collection and showcases some awesome writing/writers (including your good self of course). Thanks for popping by! It was great to meet you at Natcon, and I really appreciated the feedback on the panels – and the kind words about Epilogue.